ALEXANDRIA, VA, (January 18, 2016) – Statistician is projected to be one of the fastest-growing jobs in the U.S., according to the U.S. Bureau of Labor Statistics, following over 15 years of already strong employment growth in the field. 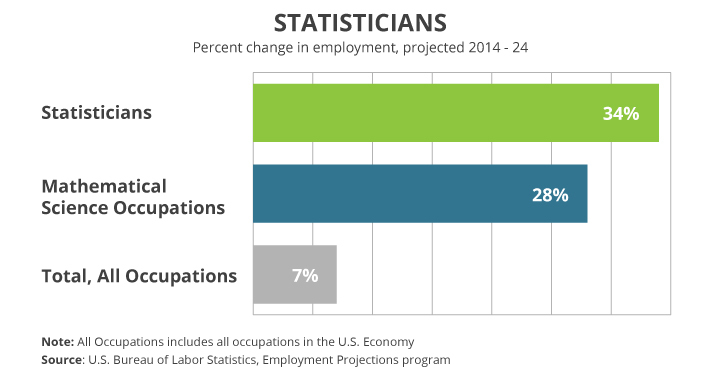 The Bureau of Labor Statistics (BLS) projects that employment of statisticians will grow 34% from 2014 to 2024, compared to 28% for mathematical science occupations, and 7% for all occupations. The field ranks 9th on the Department of Labor’s list of 20 fastest-growing occupations. Statistician is one of only four non-healthcare STEM (science, technology, engineering and math) jobs to appear on the list. Total employment for statisticians grew 54% since 2000, from 17,520 to 26,970, according to the BLS Occupational Employment Statistics. 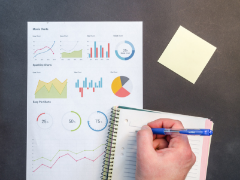 The American Statistical Association, the largest professional association of statisticians, attributes this growth to a greater appreciation for the role of statistics—the science of learning from data, and of measuring, controlling, and communicating uncertainty—by business, government and nonprofit organizations. 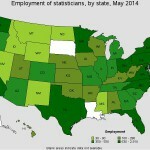 While this growth is impressive, it understates the number of jobs available to people with expertise in statistical science. Jobs such as data scientist, actuary and market research analyst, for instance, require some level of proficiency in statistical science. Together, these careers account for hundreds of thousands of high-skilled jobs. The strong demand for people who can work with and analyze data has led to increased wages for statisticians. Mean annual wages for statisticians grew 12% between 2000 and 20141 in inflation-adjusted dollars, according to data from the BLS. For a majority of other workers during this period, which includes the Great Recession, wages remained flat or dropped. “We often hear that wages are declining or remaining flat for many workers in the U.S., but that’s not the case for statisticians. People with degrees in statistics are highly sought after for their ability to analyze and interpret data and to understand risk and uncertainty,” says American Statistical Association President Jessica Utts. In response to the demand for statisticians, colleges and universities across the nation are expanding their statistics programs. The number of universities granting degrees in statistics increased 50% for bachelor’s degrees and 20% for master’s degrees from 2003 to 2014. From 2000 to 2014, master’s and doctorate degrees in statistics grew at 260% and 132% respectively. Statistics has become one of the fastest-growing degrees in the United States. The demand for statistics courses among non-statistics majors also is increasing. Elementary-level statistics enrollments in fall 2010 exceeded the levels of fall 2005 by 50%, from 54, 000 to 81,000, according to a survey by the Conference Board of the Mathematical Sciences. The Daily Pennsylvanian reported in October 2015 that the statistics concentration at University of Pennsylvania’s Wharton School is “bursting at the seams” with growing demand from business students. Data science programs—for which statistics courses are a fundamental element, along with computer science—are being offered for the first time. Several universities recently established such programs, including the University of Michigan; the University of California, Irvine; the University of Washington; and Kennesaw State University. 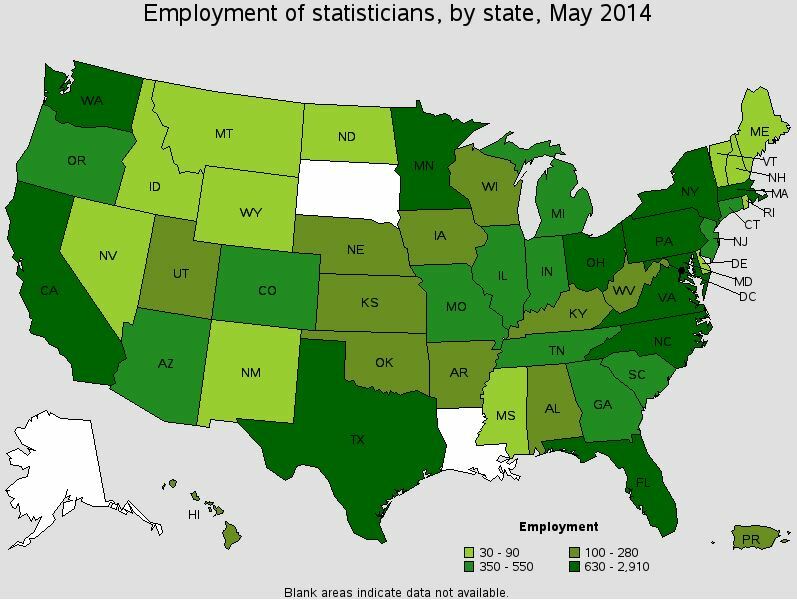 The BLS Occupational Employment and Wages report (May 2014) includes data on statistician employment by geographical region. (See thumbnail image.) Metropolitan areas with the highest employment of statisticians include Washington, DC; Boston; Philadelphia; New York; Bethesda, Maryland; Seattle, Los Angeles, San Francisco, Durham-Chapel Hill, North Carolina; and Minneapolis. The American Statistical Association is the world’s largest community of statisticians and the second-oldest continuously operating professional society in the United States. Its members serve in industry, government and academia in more than 90 countries, advancing research and promoting sound statistical practice to inform public policy and improve human welfare. 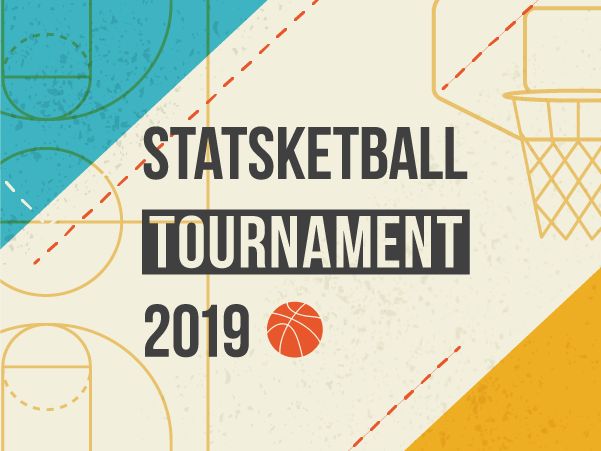 For additional information about the American Statistical Association, please visit the ASA website at http://www.amstat.org/.